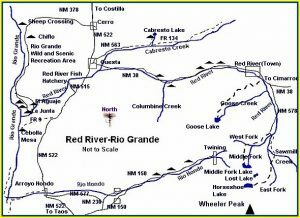 Originating high up on Wheeler Peak, the Red River makes its journey through the resort town of Red River and eventually to the Rio Grande. The Red River’s most productive section is a true wild river cascading over boulders, plunging along steep canyon walls. 10-16 inch wild browns and cuttbows inhabit this river mixed with classic pocket water and deep runs. The rugged terrain of the Red River provides solitude for those anglers in good shape looking for an adventure. Numerous warm springs feed into the river helping to keep water temperatures in the 50ís throughout the fall, winter and spring. These warm springs also keep the abundant caddisfly and mayfly populations active, making for heart pounding dry fly fishing when most rivers are snowed in. Migrating fish from the Rio Grande often move up the Red River in the late fall and winter, in order to protect this wild fishery that has had a rough past, please use ethical practices when fishing the Red River. Stripping streamers over spawning trout can place major stress and harm on these fish. We all must do our part to protect and preserve our fisheries. Red River flows westward, from Questa, to the Red River fish hatchery. Stockers are caught in the river from NM 522 to the hatchery. The aquatic insect life is meager but is slowly recovering as described in the “Upper Red River” watershed description. The Red River fish hatchery is a 2-mile drive from NM 522 to the end of NM 515. Red River is fed by several springs, on its way to the Rio Grande, which keeps the water temperature constant year-round. Below the hatchery, Red River closes into the box canyon at an elevation of 7,000 feet. From this point on deep pools, deep runs, and pocket water predominate. Three miles later the Red converges with the Rio Grande at an elevation of 6200 feet. The lower part of Red River is not stocked but does hold an abundance of wild browns but rainbows predominate. Near the confluence, browns are the predominate species. Fishing is incredible with dry flies in the evenings, terrestrials on hot afternoons, and nymph/wet fly-fishing all day. Because of the near constant water temperature, hatches of different insects occur year-round. The Rio Grande Gorge referred to by many, as the Box is about 70 miles long. The headwaters of the Rio Grande are in the San Juan Mountains near Crede, Colorado. The Rio Grande Box is open water, 30 to 40 feet wide at times, with very large boulders throughout, and some vegetation along the banks, such as trees and brush. The river is easily fishable with the possibility of catching some very large fish. The predominate fish are browns. Portions of the river have special fishing regulations. The Upper Red River begins in the Carson National Forest below the highest point in New Mexico, Wheeler Peak, at an elevation of 13,160 feet. The headwaters converge, to the north, below Wheeler Peak and east of Taos Sky Valley above the town of Red River. 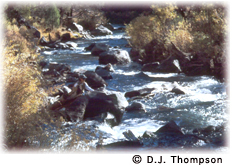 This stream holds four species of trout: rainbows, browns, cutthroats, and brookies. Hybrid cutbows also occur in the stream. A portion of the Red is stocked with rainbows. Red River converges with other streams in the high meadows below Wheeler Peak: West Fork, Middle Fork Red River, East Fork Red River and Sawmill Creek. Red River flows northwest to the town of Red River, through riffles and deep pools along NM 578. Beaver ponds in the meadows below Middle Fork Lake hold some nice fish. Red River parallels NM 38 for about 15 miles, all the way to Questa. Along the way, the Red picks up Goose, Pioneer, and Columbine creeks. There are several campgrounds along the way with plenty of small stockers to catch. Take I-25 north from Albuquerque exit at St. Francis Drive in Santa Fe, travel north on US 84/285 to Espanola and travel north on NM 68 to Taos then Take NM 522 to Questa.